Carbohydrates are usually the main source of fuel or energy that your body uses to function. By reducing your carbohydrates to a very low level, your body can go into a state called “ketosis.” During ketosis, your body begins using fat more than carbohydrates for fuel. 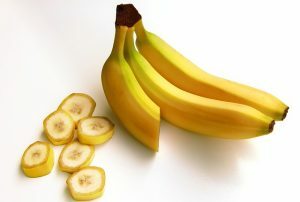 On a “normal” diet, experts recommend getting most of your calories in a day from carbohydrates. 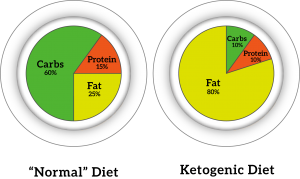 An example of a “normal” diet plate is on the left. On this plate, 60% of your calories are coming from carbohydrates. If you follow a ketogenic diet, the majority of your calories in a day must come from fat. Carbohydrates are restricted to just 10% of your daily calories. That’s a small amount! Fat makes up a whopping 80% of your calories on the ketogenic diet plate. This diet, under a doctor’s supervision, has traditionally been used to help children have less seizures.More recently, fans of the diet claim it helps people lose weight. Does the ketogenic diet really help people lose weight? Some studies have found the diet may help with short-term weight loss.However, it takes years of research and much more than a few studies to see the long-term effects of a diet. Right now there are simply not enough research studies available to say for certain whether the ketogenic diet helps with weight loss. The weight loss in some of those studies may not even be because the body was in ketosis. One study of a low-carbohydrate diet and another study of a ketogenic diet found that the weight loss appeared to be from eating less calories overall, not eating less carbohydrates. A strict diet like this is also difficult to follow long-term3,4and could impact other medical conditions you might have. Please consult your doctor before starting a restrictive or extreme diet. Next time you see a diet that claims it can help you lose weight, think of how safe it is and whether or not you’ll be cutting out important food groups. Now that you know the facts, you won’t be a fool for the ketogenic diet.